Perfection. 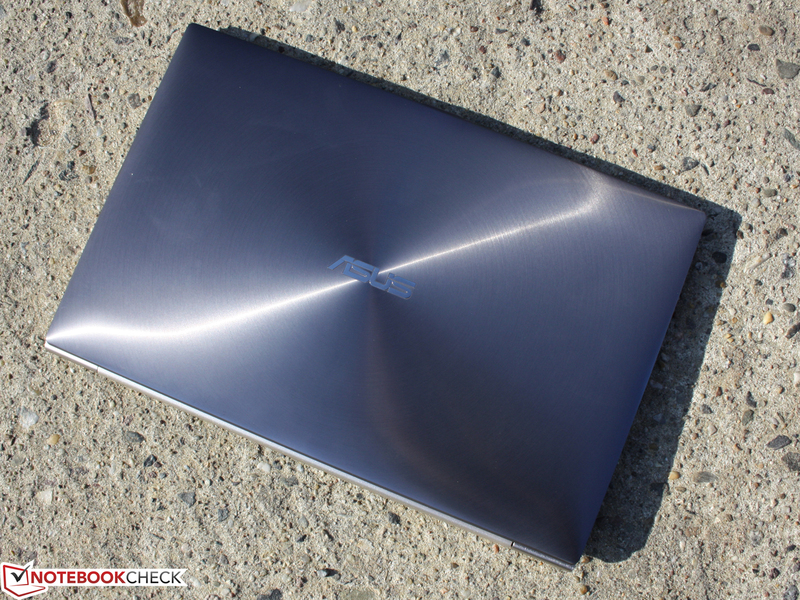 The power version of the Zenbook, with a Core i7, is as handy as a netbook but faster than most multimedia machines. How is this possible with a build height of 17 millimeters? The lightning-fast ADATA SSD sets the standard higher than ever. 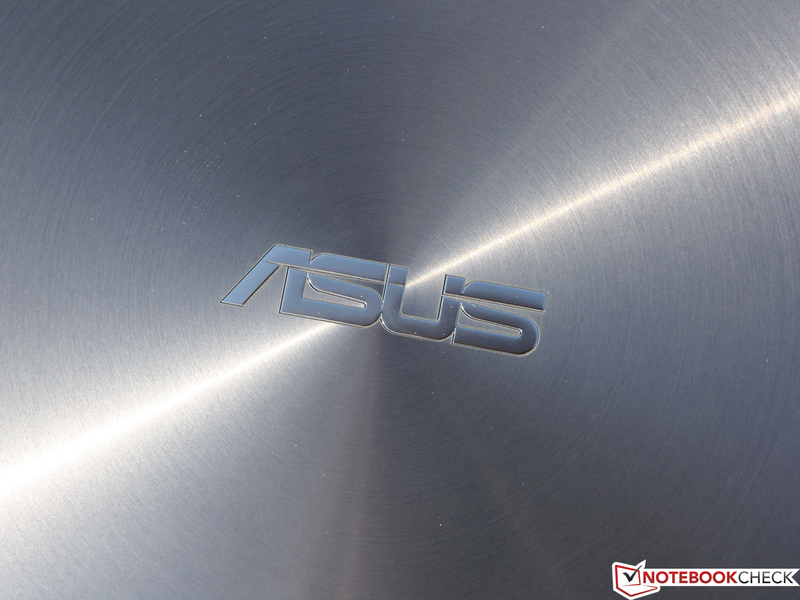 Asus Zenbook UX21E: Is the 11.6 inch device as perfect as the name suggests? 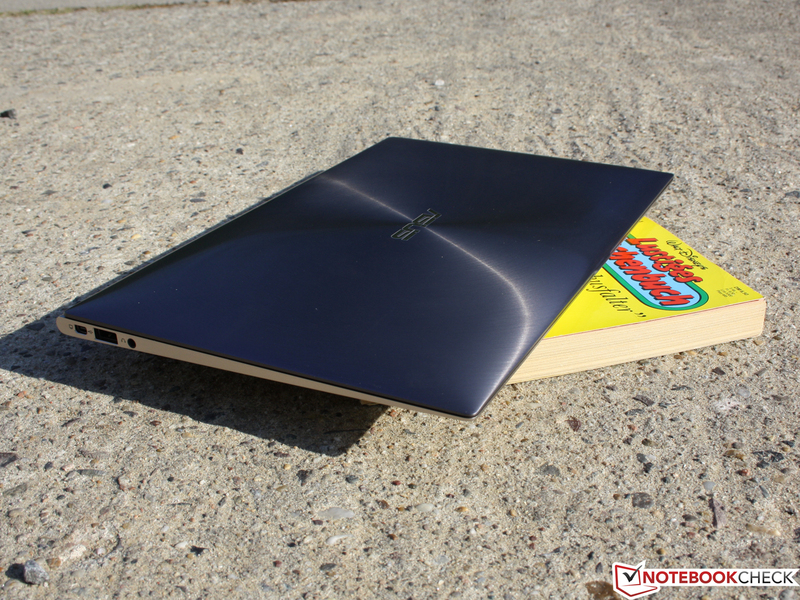 Will the Zenbook dethrone the MacBook Air? 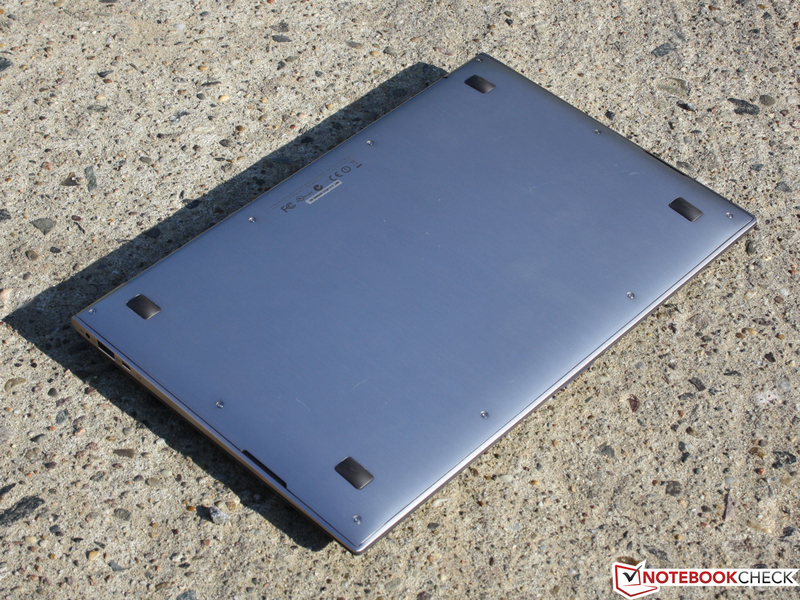 In the past few months, a lot has been written and discussed about UltraBooks. Many looked skeptically at the price tendentiously over 1000€. Others discussed about the profit margins and predicted quantities. Intel wanted a 40% market share in 2012 and was ridiculed for that. All of that doesn't impress us as technology fans. 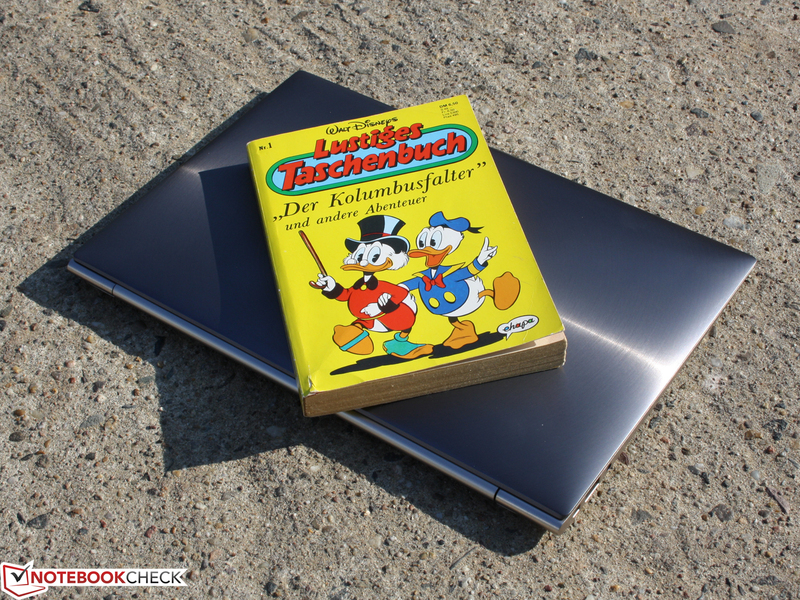 More important is: after the initial contact behind closed doors at the IFA 2010, we are now holding the probably thinnest and, at the same time, most powerful subnotebook in our hands. Or better - the Zenbook, which can be translated as simplicity or perfection (Zen Buddhism). MacBook Air 11? That was yesterday. This Windows machine, UX21E, doesn't look like much but that is deceiving. Do you believe in love at first sight? 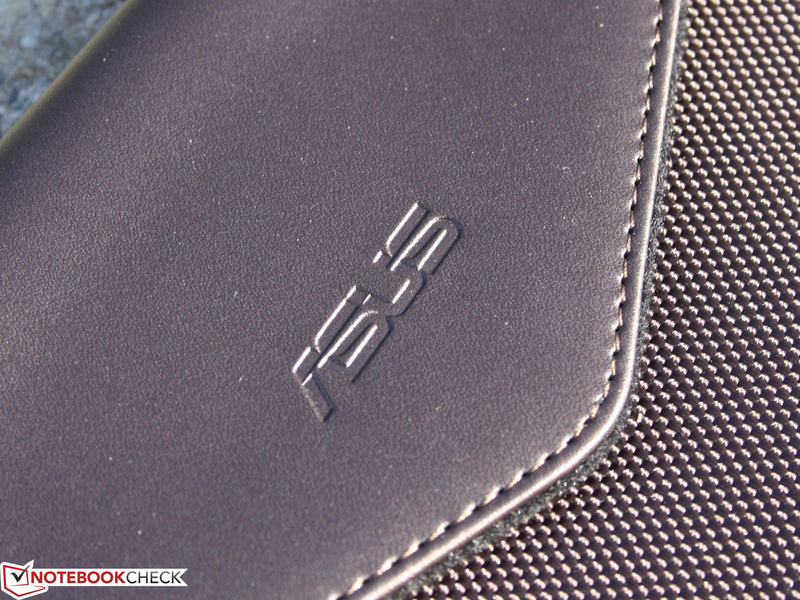 This is the headline that Asus uses on a large format banner over the Zenbook range on its German homepage. And in fact, the manufacturer can afford to brag like this: The 11.6 inch UX21E, as the smallest member of the new family, is impressive at first glance and first touch. The aluminum case is beyond any doubt in terms of solidness and quality, and it is on a par with Apple's unibody concept. 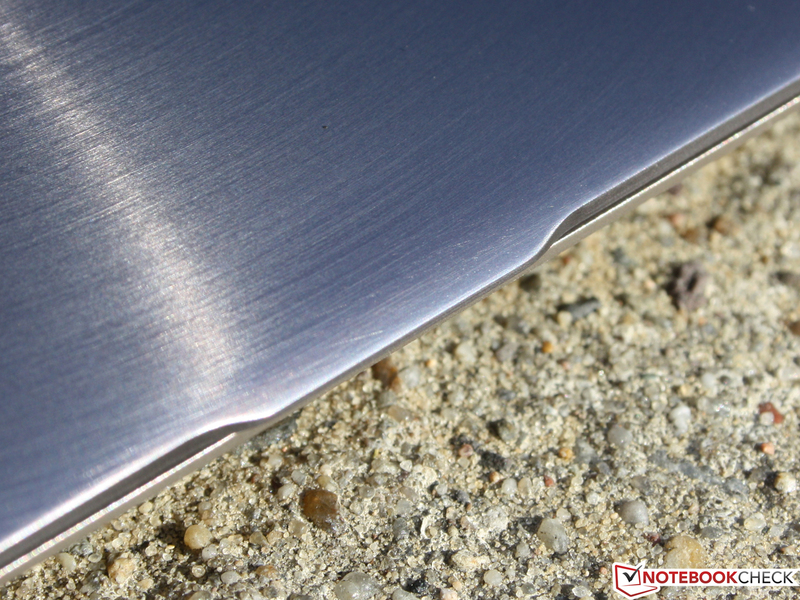 This also applies to the details, such as the thin but extremely stiff lid and the hinge. No matter how it's looked at, the body doesn't show any flaws in workmanship anywhere. The base unit is made up of one top part. The interfaces stick out on the right and left. The bottom is a homogeneous surface curved to the sides that doesn't have any air outlets or even maintenance covers. 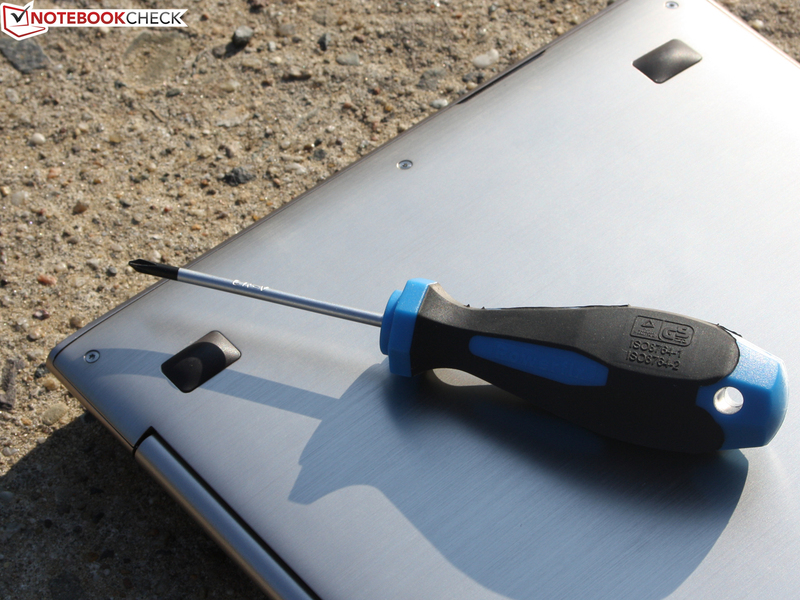 The plate can be taken off by removing Torx screws. But that is not very useful because the WLAN module and RAM are soldered onto the mainboard. The "hard disk", an ADATA XM11 (128GB SSD), isn't installed in a 2.5 or 1.8 inch form factor (typical for notebooks, subnotebooks, and netbooks) and plugged into the standard SATA connector, but is rather set as mSATA. The spatial conditions of the not more than 17 millimeter high chassis (thickest point incl. feet) don't support a generous configuration of ports. Moreover, there is the claim of perfection and cleanliness. A row of plugs wouldn't look right here. 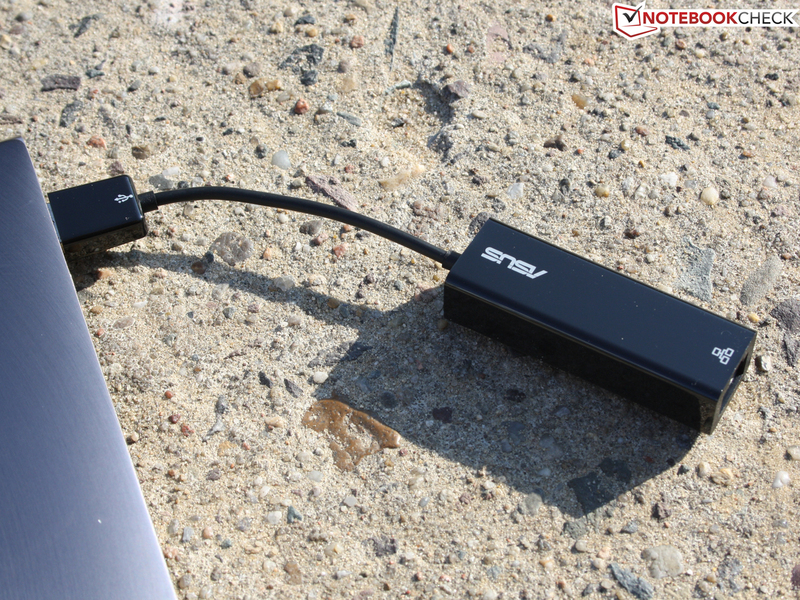 The UX21E's connectivity is therefore conservatively limited to two USB (1 x 3.0), micro HDMI, mini VGA (for dongles) and headphones. 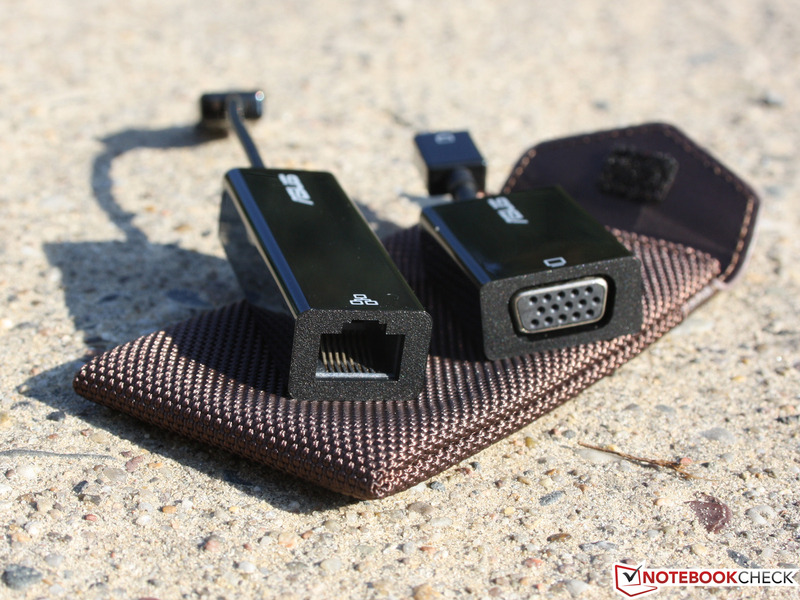 The manufacturer solves the problem of the too large VGA D-Sub plug and the too high RJ45 port via an adapter, respectively via a USB Ethernet card (ASIX AX88772B). So users who have to use a projector (typically: VGA) for a presentation can use the included adapter. 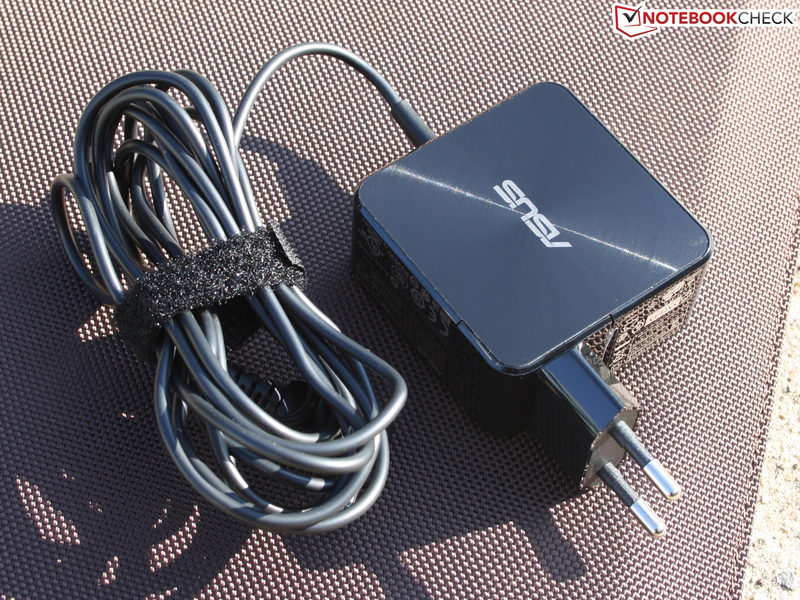 Adapters for micro HDMI type D (M) to HDMI type A, 19 pin (W) are available for little money in retail. Although an Ethernet adapter hasn't been installed, there naturally is a WLAN adapter that supports the latest draft-n standard (Atheros AR9485WB-EG). Unexpectedly, a Bluetooth 4.0 +HS unit is also installed (Atheros AR3012). BT 4.0 is the low energy version that is also used in devices with a button cell battery. BT 4.0 is not yet used standardly in notebooks. Beside the dongles and the usual quick start manuals, more accessories are found in the box. 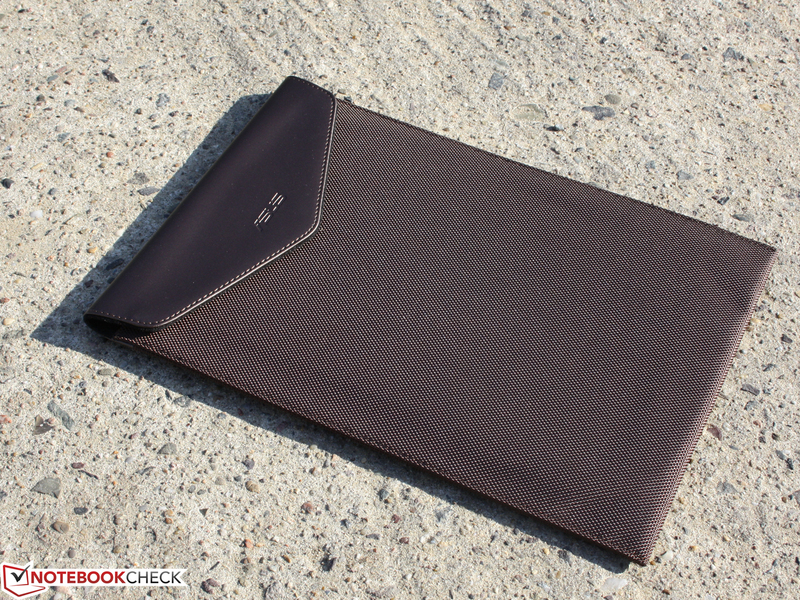 It is a high quality slim case made of faux leather. There are no recovery DVDs for Microsoft Windows 7 Home Premium 64 bit included. 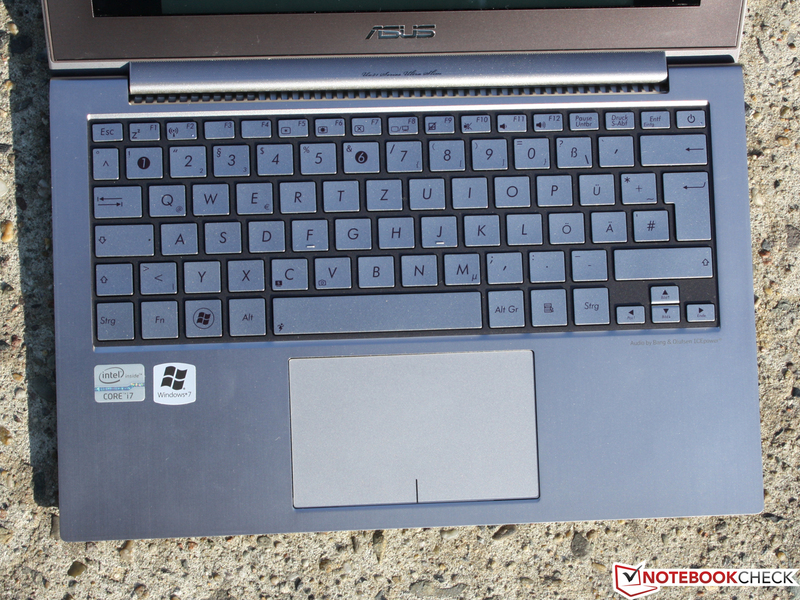 Asus grants a manufacturer warranty of 24 months on its UltraBooks (including pick-up & return). Users can also attain a warranty extension for a period of three years for about 90€. High quality slim case made of faux leather. The keyboards are submerged into a matt plastic plate. 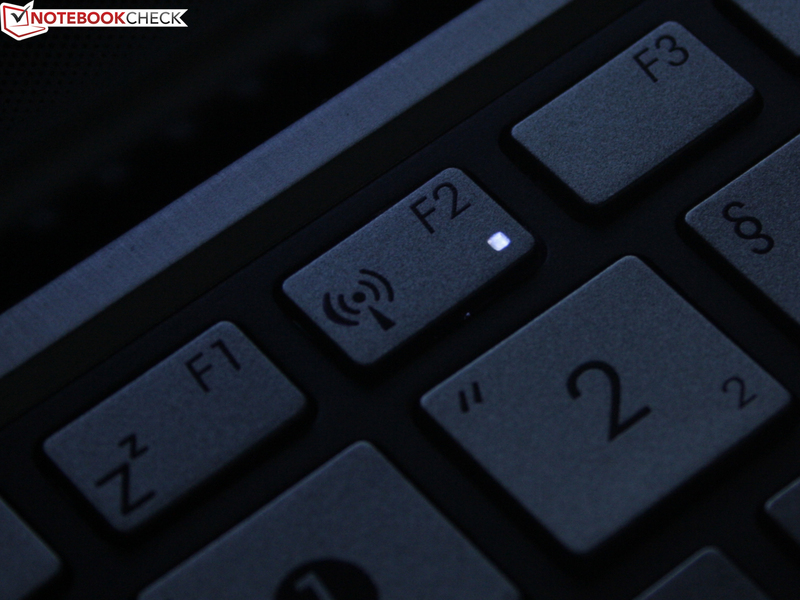 Pressed keys are on a level with this grid and even deeper under high pressure. The wrist rest is generously sized and even large hands have room. 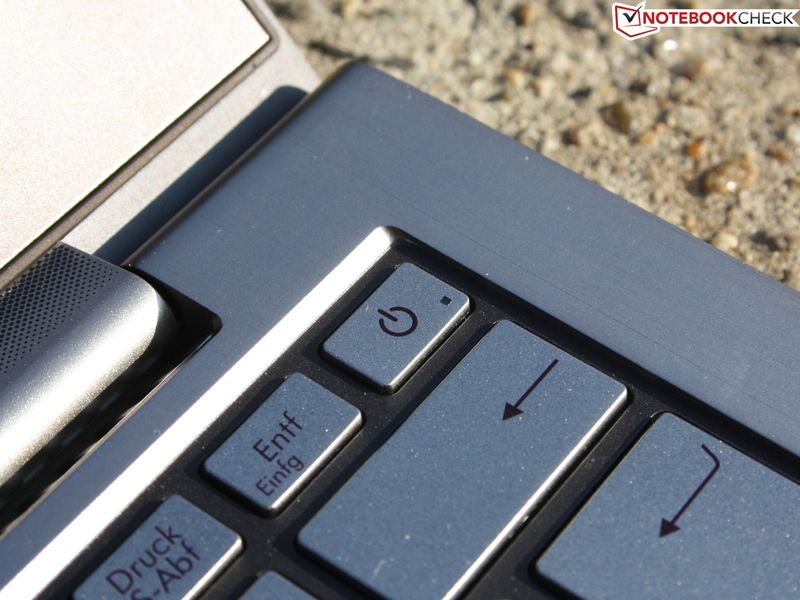 Positive: the small but separated arrow keys can be found without looking. Asus hasn't built in a key light. 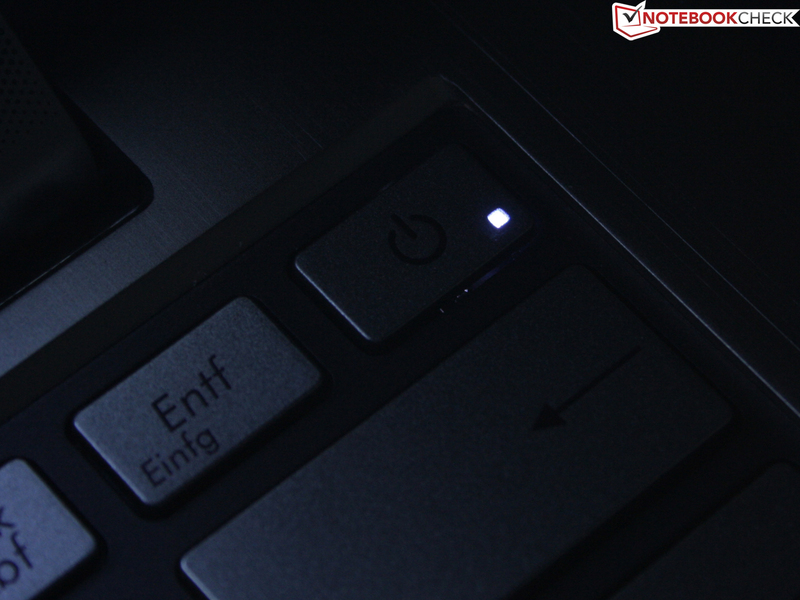 The power on button is part of the keyboard and is found in the right corner beside "delete". Thus, a typo can quickly lead to an unintentional shutdown or standby. The keys are absolutely level, i.e. they do not have conical inside curve (for accuracy). We notice the clear pressure point and firm stop (not hard) positively. The design-related, low key drop of only two millimeters causes a somewhat short and unsatisfactory typing feel, though. The keys have a smooth surface that can get a greasy feel depending on the fingers' moisture. The marks for touch-typists are very clearly palpable. The multi-touchpad, model Elan SmartPad, is very big and matt (no fingerprints, good gliding traits). The "click pads" specialty is a "left mouse key" beneath the entire area of the sensitive surface. Alike the Apple MacBooks or the Samsung Serie 9 900X3A, the pad surface sinks by a millimeter and thus triggers a left mouse click (or double click). The pad also has a right mouse key that usually opens context menus. The right and left key are in the front area. The surface above it isn't touch-sensitive. That is very good because it prevents an irritating cursor movement when only a click is to be implemented. The Samsung Serie 9 900X3A has such a drawback. The mouse keys' drop is good (two millimeters), but could be a bit clearer (for speed). The pressure point is sufficient, the stop is soft and the click is quiet. The 11.6 inch screen has a resolution of 1366x768 pixels, so typical for the small form factor. Users who want a more clearly arranged desktop will have to buy the 13.3 inch UX31E, which is equipped with a HD+ resolution (1600x900) in every configuration version. 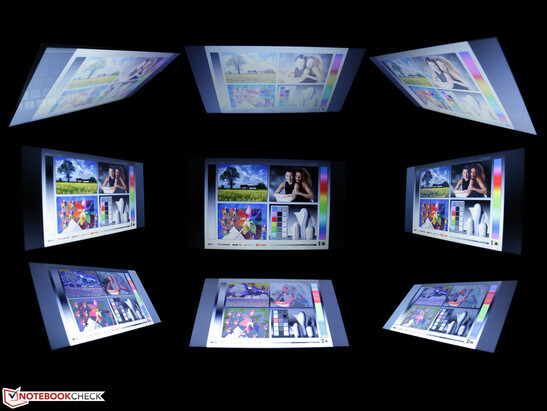 The reflective screen shows its qualities in brightness. Colors and contrasts couldn't convince us. We calculate a contrast of 144:1 due to an extremely weak black value of 3.31 cd/m2. A high contrast generates bright and vivid colors. The glare type can make them look a bit better, but on total they look rather pale. The Adobe RGB (t) and sRGB (t) color gamut are failed by far (pictures 1 & 2). We place the "VAIO Premium display" of a Vaio SE1Z9EB (FHD) next to it for comparison (AdobeRGB coverage). 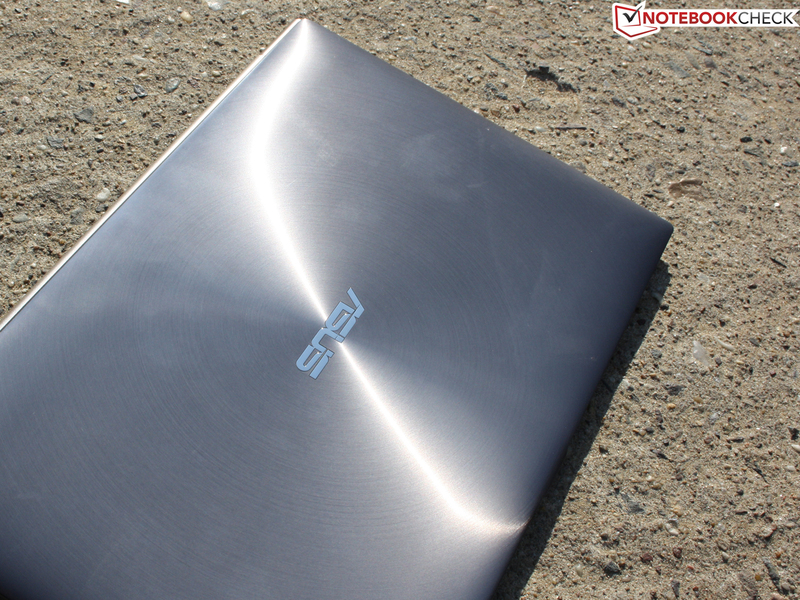 To live up to its claim of being a synonym for mobility, the Zenbook supplies an tremendous luminance. The screen reaches a gigantic 478 cd/m2 selectively (nearly the top rate in the laptop database!). Averagely, it is still an extremely good 441 cd/m2 (top rate). The previous brightness leader, Samsung Serie 9 900X3A (matt, max. 482, average 413 cd/m2), is thus ousted. The brightness distribution of 87% is relatively good despite the high luminosity. Regrettably, the splendid brightness isn't attached to a matt, but rather a glare type. Thus, the usual annoying reflections develop when sunlight hits the screen at an unfavorable angle. The brightness helps to reduce this effect. Brightness settings on high in battery mode have the disadvantage of a shorter runtime. The despite it all rather poor battery life was determined with a setting of 100 cd/m2 (WLAN test, movie) in this review. It could get problematic should these times turn out to be even shorter. The brightness is decreased to 395 cd/m2 in battery mode (center). The horizontal viewing angles are only stable up to about 45 degrees. Beyond that, the contrast fades and the colors invert. When our view sways downwards (vertically), the displayed script stays well legible up to about 35 degrees. However, colors already start to clearly invert at 10 degrees. Consequently, it is a viewing angle weak TN screen. That's too bad because such TFTs are installed into every low cost laptop. Many users would likely be willing to pay a bit more for a higher quality IPS screen. The Intel Core i7-2677M (standard: 1.80 GHz, Turbo: 2.0 up to 2.90 GHz) is a brand new dual core processor of the second Intel Core generation from 2011 (Sandy Bridge). The TDP is 17 watts (laptops otherwise 35 and 45 watts). In contrast to the Intel Core i7-2620M (dual core, 35 watts) frequently used in subnotebooks lately, the TDP is significantly lower. However, this only applies to the standard clock. A Core i5-2467M (1.60 GHz, Turbo up to 2.00 GHz) is available for the UX21E-KX004V as a less expensive version. The RAM has a normal capacity of 4 GB (DDR3). It is soldered to the mainboard and couldn't be read out (onboard). The HD Graphics 3000 is embedded into the CPU (shared memory). The 128 GB SATA SSD will prove to be the UX21E's engine. The mSATA model, XM11, from ADATA is not available in retail sale. 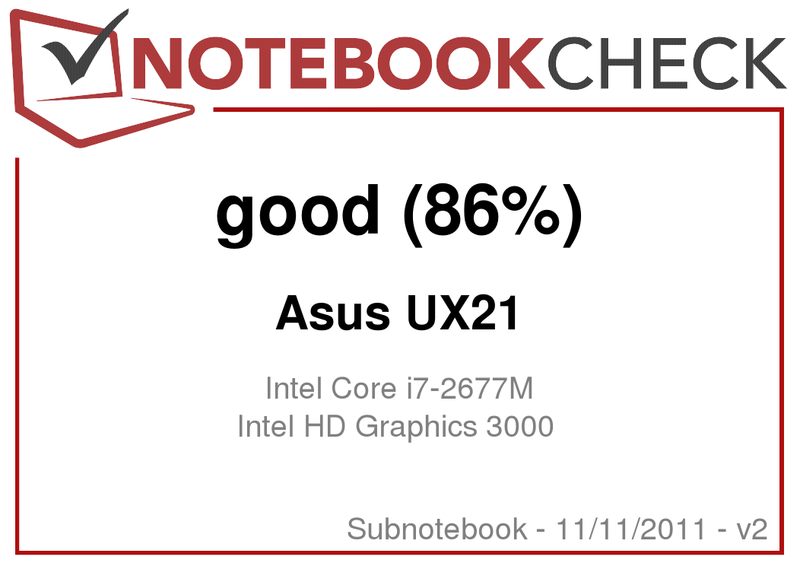 The Asus UX21E proves to be powerful with its dual core i7-2677M: The processor test, Cinebench R11.5 (64 bit, multi core calculation) rewards the system with 2.13 points. The i5-2537M in the Samsung 900X3A only manages 1.41 points in this exercise. The UltraBook with the Core i7 CPU is consequently on a par with the normal laptop processors, Core i3-2330M (2.1) or the older i5-430M (2.0) in processing speeds. A Core i3-2310M (used frequently) only achieves 2.0 points. The performance boost becomes very obvious when we look at the 2010 low voltage CPUs (Arrandale). An i5-470UM (1.33 - 1.86 GHz, 18 watts) reached 1.3 points in the R11.5 test. An i5-560UM (1.33 - 2.13 GHz, 18 watts) managed 1.5 points. The cheaper alternative i5-2467M, as used in the Acer Aspire S3-951-6646 (UltraBook) and in the Macbook Air 11 inch 2011-07 MC969D/A, isn't significantly weaker: 1.9 points. The results were similar in the other CPU test, e.g. WPrime 2.0 with 732 seconds (the lower the better). The i5-2467M needs 869 seconds here. 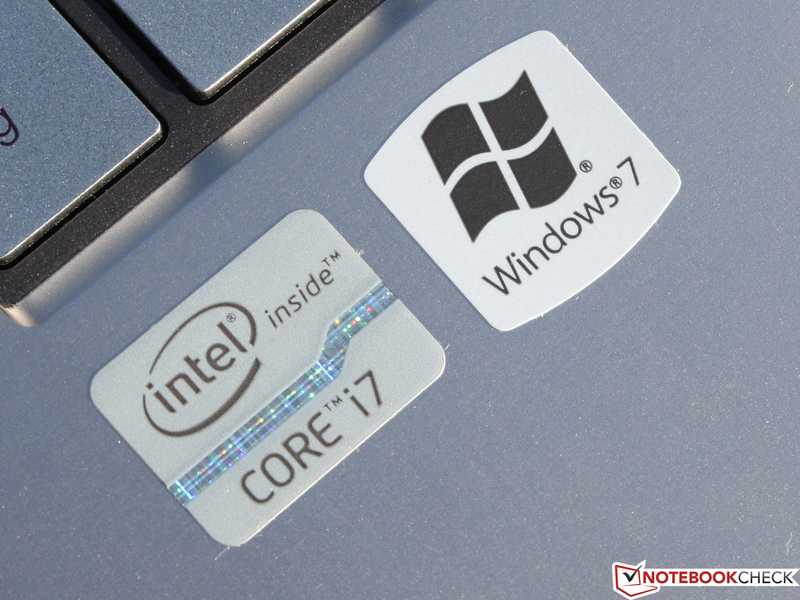 Thus, the Core i7 is only beneficial for performance fans. Turbo 2.0 does its job perfectly, as the high scores prove. We don't notice any performance decreases since the clock is 2.6 GHz in the beginning of the multi core tests and then only drops to 2.2 GHz. This is still within the Turbo range and above the 1.8 GHz standard clock. What about the experienced and assessed application performance in interplay of CPU, graphics, RAM and the 128 GB SSD? The subjective speed is very fast. Installations are finished in a flash, simultaneously executed programs don't hitch and programs are opened within seconds. The same is true for a system cold start (16 seconds) or a warm start (2 seconds from standby). PCMark Vantage and PCMark 7 represent the measured scores. The total scores of 11054, respectively 3612 points are very good. The scores are slightly better than that of the Samsung Serie 9 900X3A with 10833, respectively 3448 points. 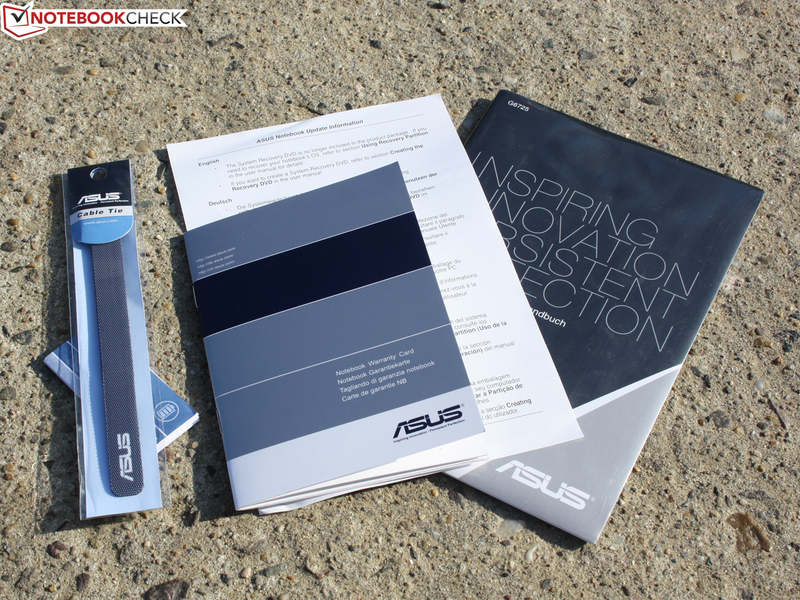 PCMark 7 (3612 points) loves the ADATA SSD. Only gaming laptops or workstations equipped with a 2630QM or 2920XM (+SSD) reaped in higher scores until now. The Alienware M18x (4579), the Fujitsu Celsius H710 WXP11DE (3695) and the XMG P501 PRO (4208) would be mentioned here. 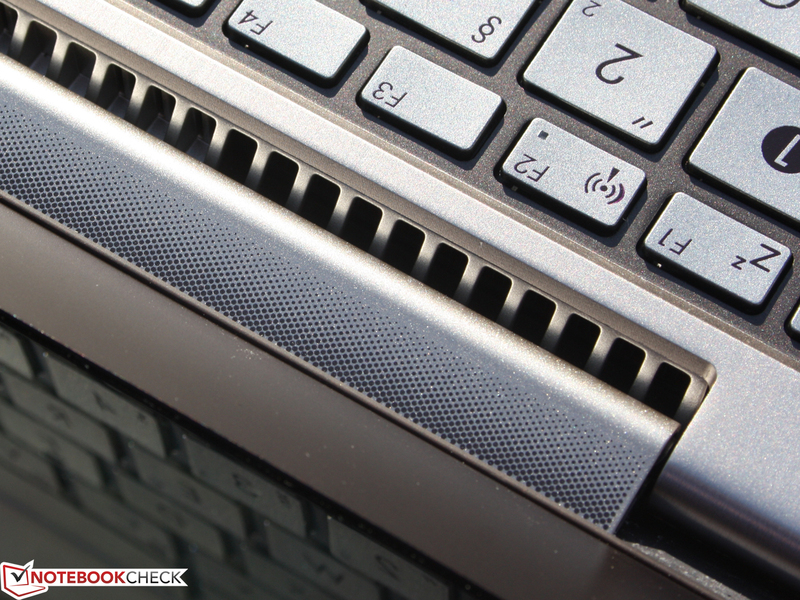 Normal i7 dual core laptops without an SSD only manage 2000 points (Vostro 3350). Remarkable: The aforementioned laptops have a dedicated graphics card and consequently their advantage should actually be much greater. That an 11.6 inch device closes in on the machines with support from an SSD is impressive. The GPU can overclock at the expense of processor performance in the Turbo concept. Nevertheless, it is partly weaker than an identically named HD 3000 in an i7-2620M or i5-2410M. The reason is the lower base clock of 350 (rather than 650 MHz) and Turbo clock of 1200 (rather than 1100-1300 MHz). A HD 3000 could manage around 4000 to 5000 3DMarks06 according to that. However, the UX21E only supplies 3755 points. On the other hand, the Cinebench R11.5 Shading test result is very good: 9.78 points. Most HD 3000 chips in Core i3 and i5 lie around 7.0 points. An Intel graphics embedded into a 2620M occasionally even achieves 9.0 points. It seems remarkable that there is no difference between the i7-2620M and 2677M in the Heaven 2.1 3D benchmark (8.1 fps). 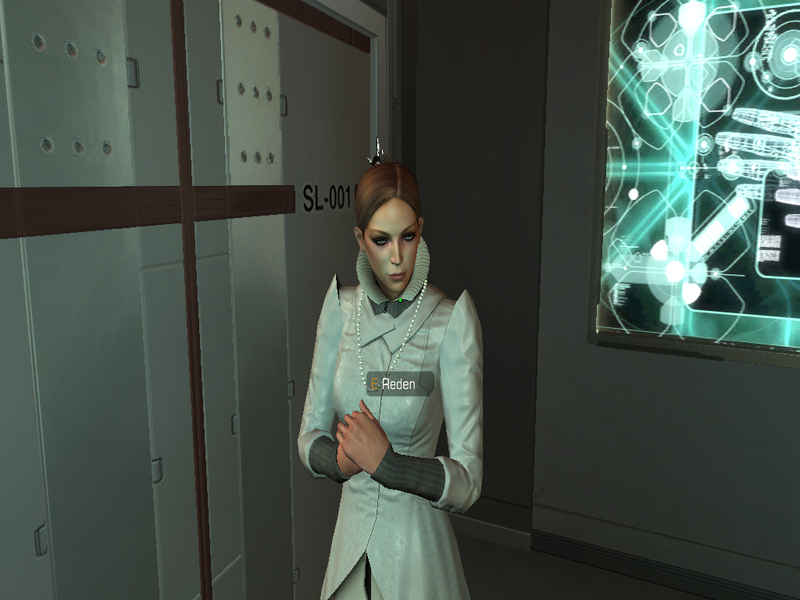 The embedded DirectX 10 Intel HD Graphics 3000 is, as in previous reviews, the wrong candidate for the latest games. No matter if with or without DirectX10, smooth game play is only possible in the lowest details and resolutions. 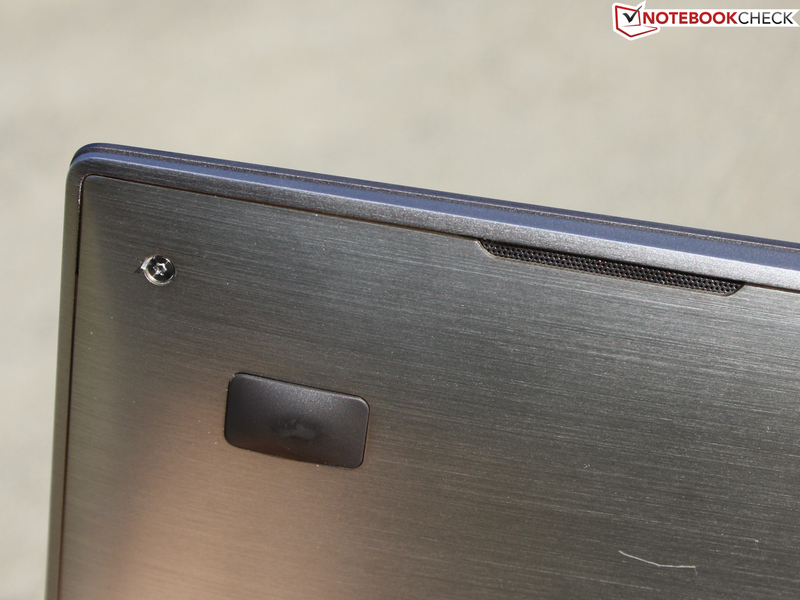 The reason for the Zenbook UX21E's staggering swiftness is the ADATA SSD's fast access times. They boost the PCMark Vantage HDD score to 42351 points. Only the Chiligreen Mobilitas OV0789 (2620M, GeForce GT 550M), with an OCZ Vertex 3 VTX3-25SATA3-120G (RAID 0), had such a good score until now. The Samsung 900X3A "only" managed 15599 points and a Vaio Z13 with a Quad SSD achieved 13055 points here. All in all, the customer gets one of the fastest SSD memories available on the market, which consequently ensures the best performance in an 11.6 inch device that we have ever measured. 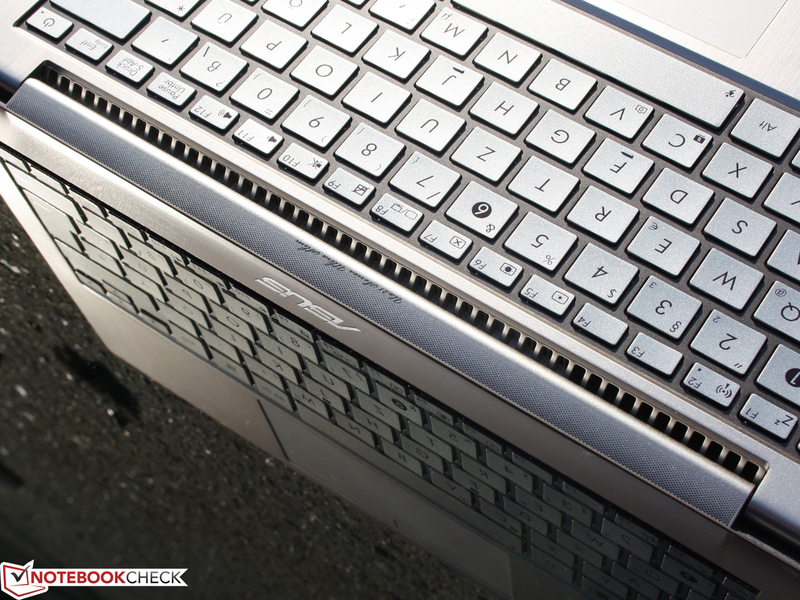 Strong laptops with a conventional hard disk (7200 rpm) at best reach about 6200 points (e. g. HP Elitebook 8540w). The read and write rates are behind the HDD scores of the system benchmarks, which we determine with HDTune, CrystalDiskMark and AS SSD. The ADATA XM11 is connected to the SATA-6Gb/s port, which allows read throughputs well over 400 MB/s even without RAID 0 (SandForce SF-2281 controller). We have mixed feeling about the noise. The UX21E is always inaudible when idling, no matter if with inactive (29.6 dB (A)) or with a quietly whirring (30.1 dB (A)) fan. Occasional load while surfing on the Web or other tasks lets the level increase gently to 31 dB (A). This pussyfooting doesn't last for long, though. When the processor and/or IGP graphics is loaded, the 11.6 inch laptop gets very loud. The high-pitched noise quickly reaches 42 dB (A) (3DMark Vantage, Cinebench R11.5). We also measure 42 dB (A) in the stress test (CPU & GPU). At least the fan runs consistently. The loud fan can only manage the waste heat to an extent in high, and especially constant load. The peak temperatures of up to 46 degrees Celsius are tolerable and in no way harmful. Despite the aluminum case, the waste heat isn't evenly distributed over the top and bottom. The CPU throttling of the new Intel processors that some readers perceive as threatening doesn't occur in the i7-2677M. Even the multi-hour stress test of GPU and CPU can't push the clock under 1.5 GHz (unrealistic scenario). Providing no concurrent GPU load is applied, which by definition branches off power (from the TDP), the clock stays at a minimum of 2.0 GHz in multi CPU load (Prime95). That is higher than the standard clock of 1.8 GHz, so still within the Turbo range. The variable, temperature-dependent clock (including overclocking) is a feature of the Intel CPUs. 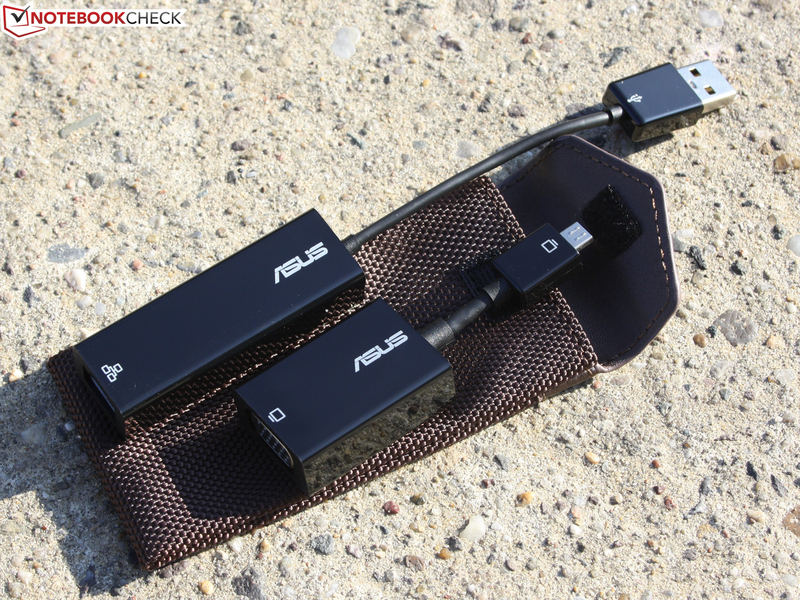 The performance has already been throttled to 800 MHz, for example, in games or CPU heavy applications in a few devices, such as the Acer Aspire TimelineX 3830TG. (±) The maximum temperature on the upper side is 43.7 °C / 111 F, compared to the average of 35.8 °C / 96 F, ranging from 22 to 57 °C for the class Subnotebook. (+) In idle usage, the average temperature for the upper side is 28.6 °C / 83 F, compared to the device average of 30.7 °C / 87 F.
Where are the speakers? There are two of them. Two elongated openings are located on the wrist rest's (bottom) right and left. The stereo speakers supply a midrange heavy, but good sound in view of this form factor. The little membranes can't render deep pitches or trebles very well. 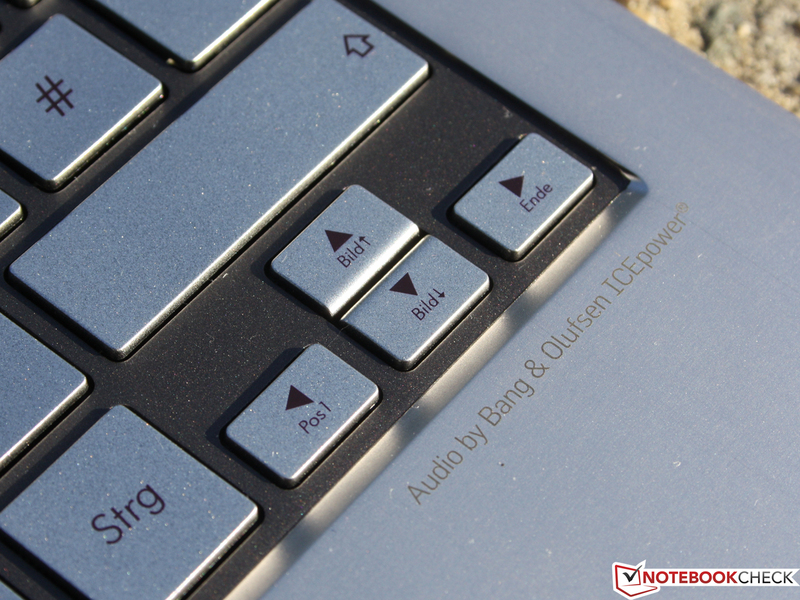 Users should refrain from using the maximum volume because the speakers start to distort and scratch. The laterally placed audio socket (headphone, no microphone!) works perfectly and without noise on two Yamaha speakers (YST-M20SDP). 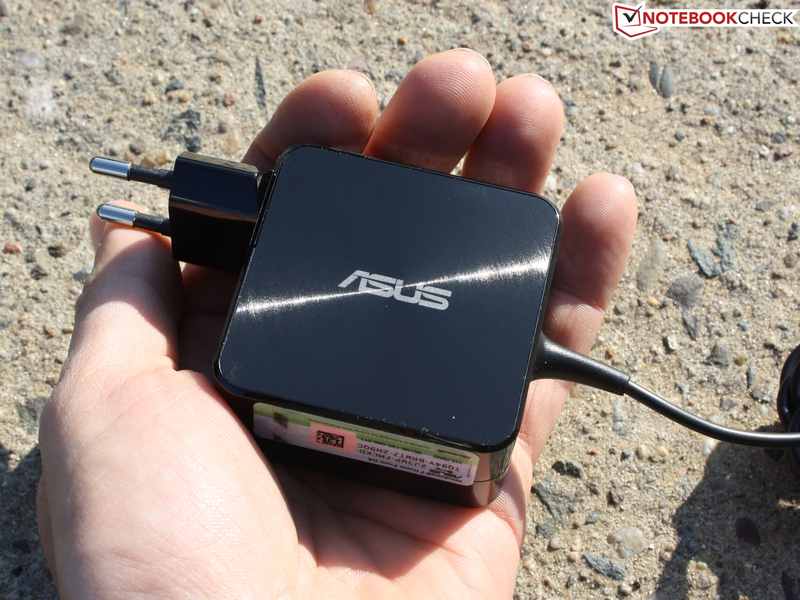 The consumption measurements from the outlet (battery charged to 100%) show a modest UltraBook. We measure only 6.6 watts in idle. This is due to the frugal components. The LED screen, with its high brightness and the operating mode "high performance", can however push the idle power consumption up to 11 watts. 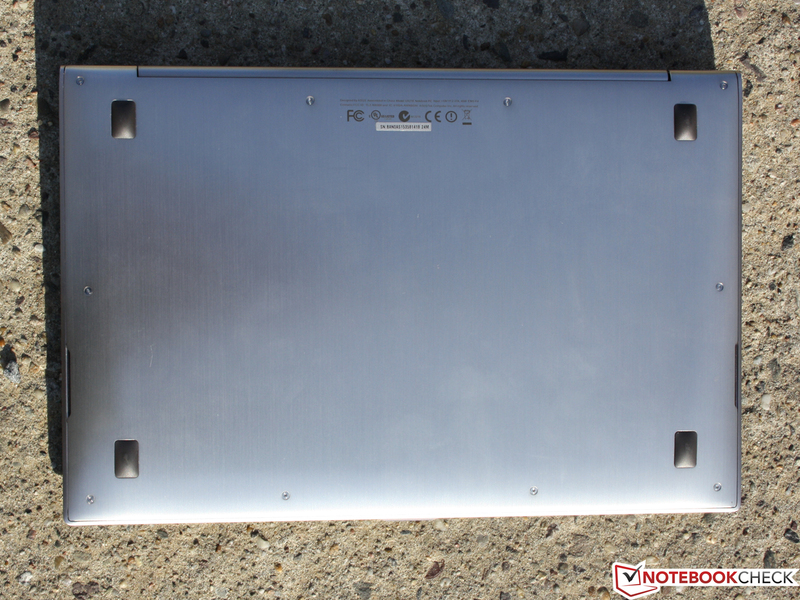 The power consumption increases during load, but stays significantly below the 50 to 70 watts of conventional notebooks. When only the processor stress test loads the i5-2537M, the multimeter records 29.5 watts (@ 1.8 GHz constant). The power consumption increases to 31.3 watts when the 3DmMark benchmark (Furmark) is added. 3DMark06 consumes 34 watts by itself. 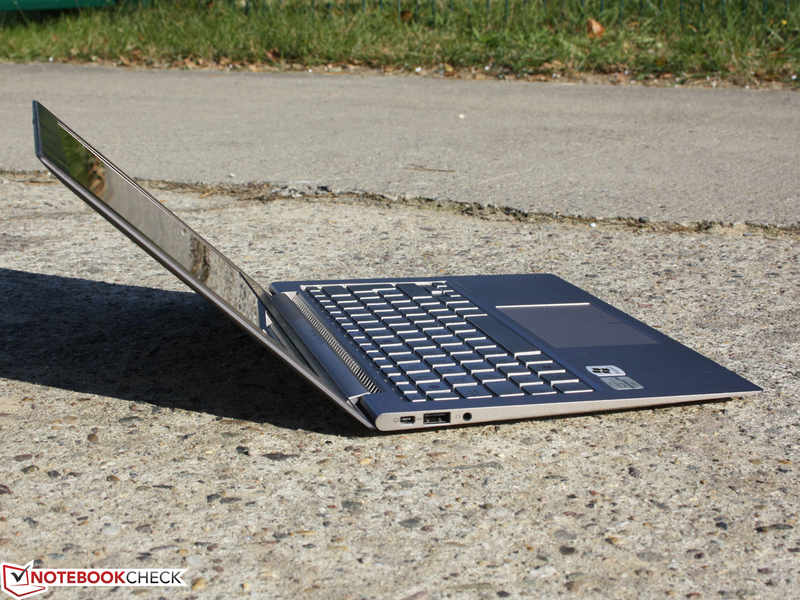 Intel calls for a period of at least five, but better seven, hours from UltraBooks. 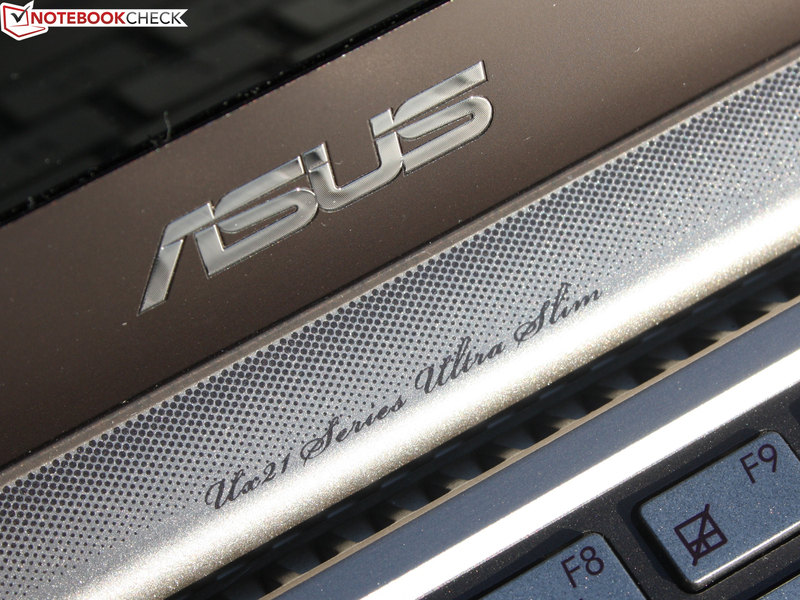 Our Asus UX21E clearly fails this demand. At least in the practical test where it ends up with only 3:37 hours in the WLAN test (217 minutes). The brightness was only set to 100 cd/m2 and we visited news sites and sporadically watched news podcasts. After recharging the built-in battery (35 Wh), the 11.6 inch laptop lasted for 2:29 hours in CPU load (highest brightness). During a low definition movie (low resolution avi), we determined 3:54 hours (234 minutes, 100 cd/m2, wireless off). In view of the normal use of this mobile device and compared to the competition, the runtime is disappointing. The Acer Aspire S3 Ultrabook (HDD version, Core i5) however only managed 213 minutes in the WLAN test. On the other hand, there are many 11.6 inch devices (Samsung 900X1B: 356 minutes) or 13.3 inch notebooks (Samsung 900X3A: 338 minutes) with a considerably longer battery life. Thus, the Dell Vostro V131 didn't even need a low voltage processor for its 476 minutes - a 65 Wh battery sufficed. And it is just this capacity (35 watts) that is the UX21E's weak point because the energy absorption is very low. 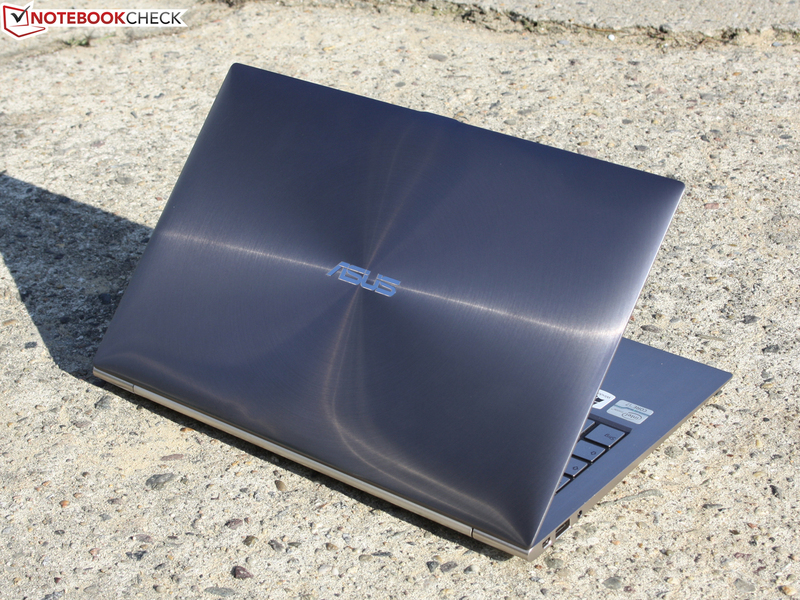 The Asus Zenbook UX21E-KX008V (RRP: 1099€) enters the stage with a bang. The application performance is very good thanks to a fast ADATA SSD. 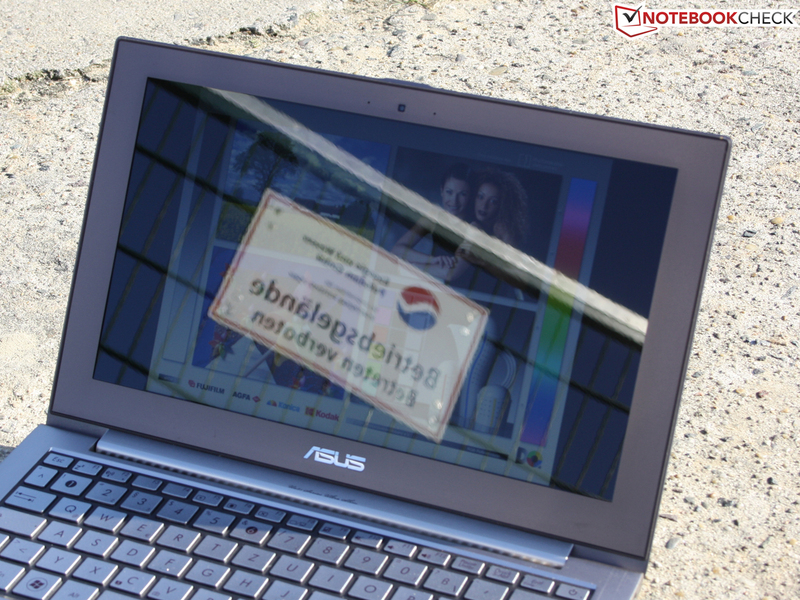 Except for the low gaming performance, users won't notice a difference to a conventional desktop or notebook. 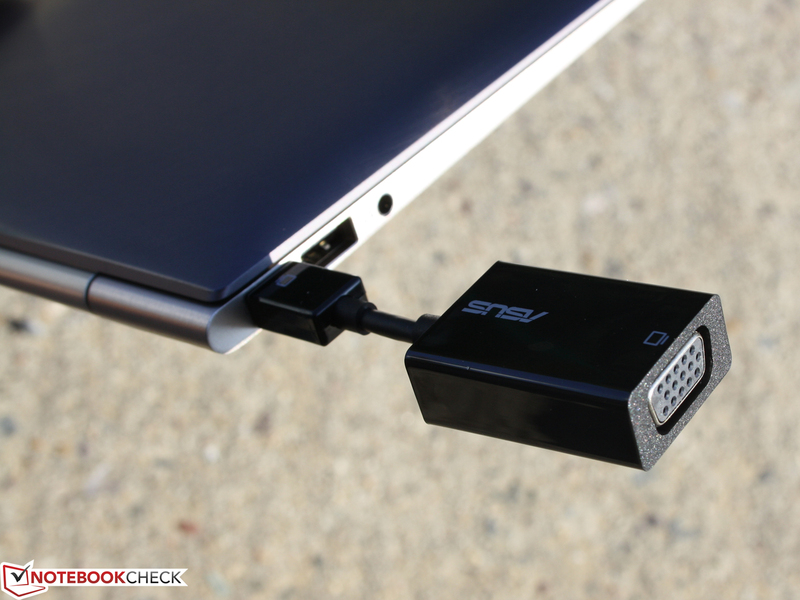 Quite the contrary, the UX21E is superior to HDD based devices or even many SSD laptops in the access times. The compact, solid and high quality workmanship of the aluminum body is in a class of its own and is virtually in no way inferior to Apple's MacBook Air. 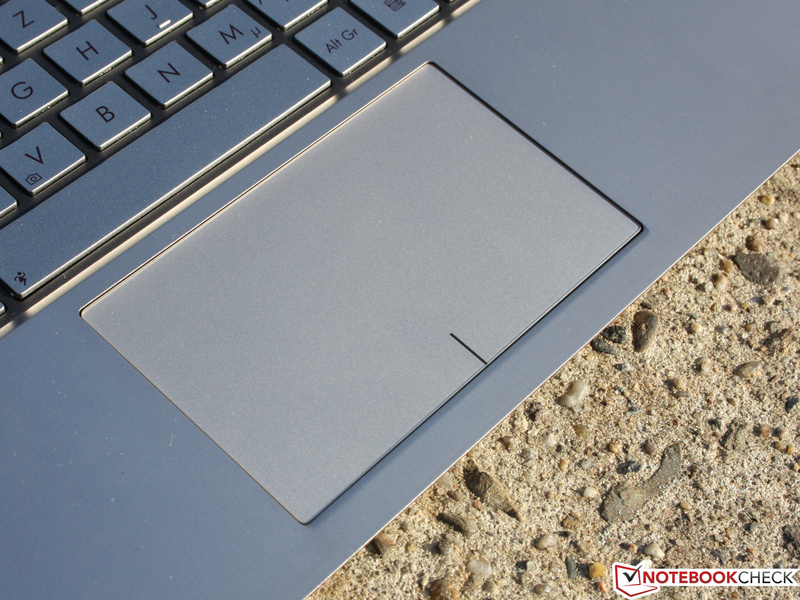 The big click pad is very comfortable to use, the keys are basically pleasant but have a short drop. The interfaces are minimalistic by design, but are expanded with practically relevant, included adapters (VGA, Ethernet). 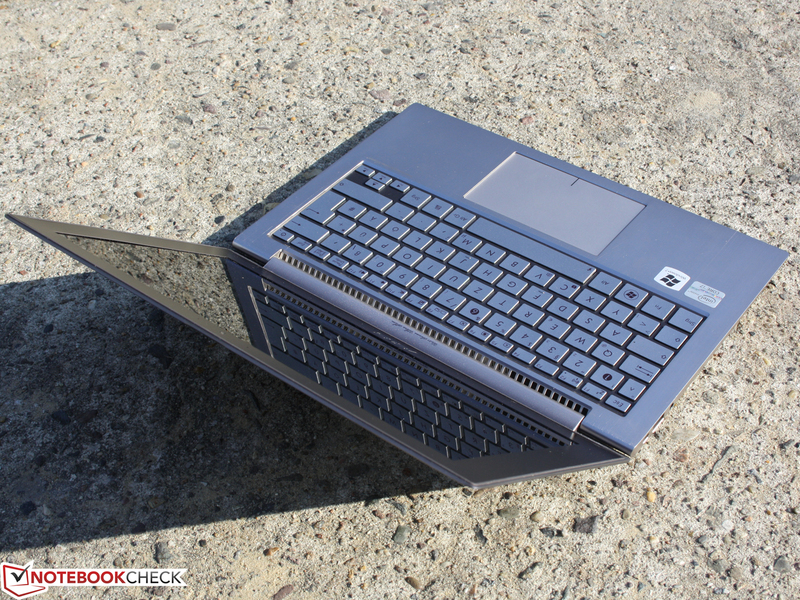 Can the Zenbook UX21E-KX008V beat the MacBook Air 11 (2011)? No, because the screen is too weak (low contrasts, narrow viewing angles) and the battery life is too short. The Air has a higher contrast and wider viewing angles. The enormous brightness of the HD display is hardly of any use for the UX21E because the screen isn't anti-reflective. 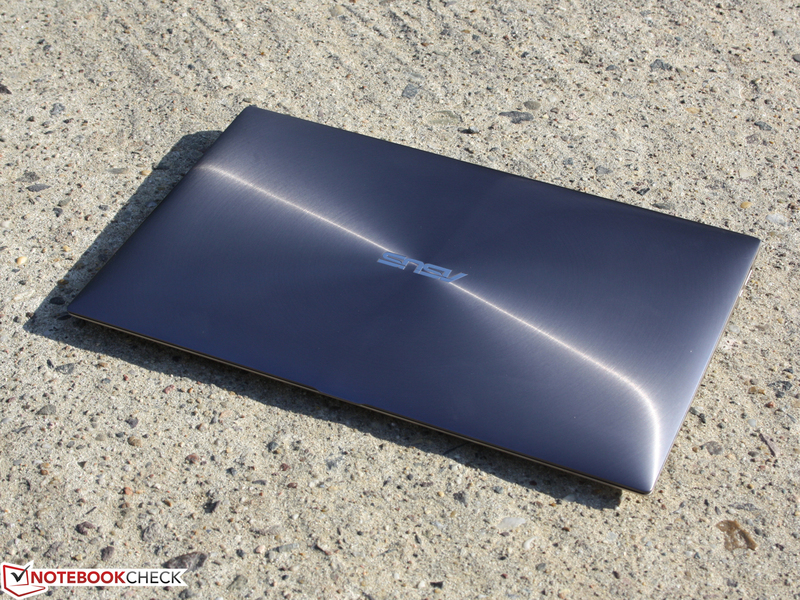 The UX21E can beat Acer's inexpensive entry-level UltraBook S3 in any event. It reached poorer results with a battery life of 3:33 hours and a run of the mill screen with a low contrast and low brightness. 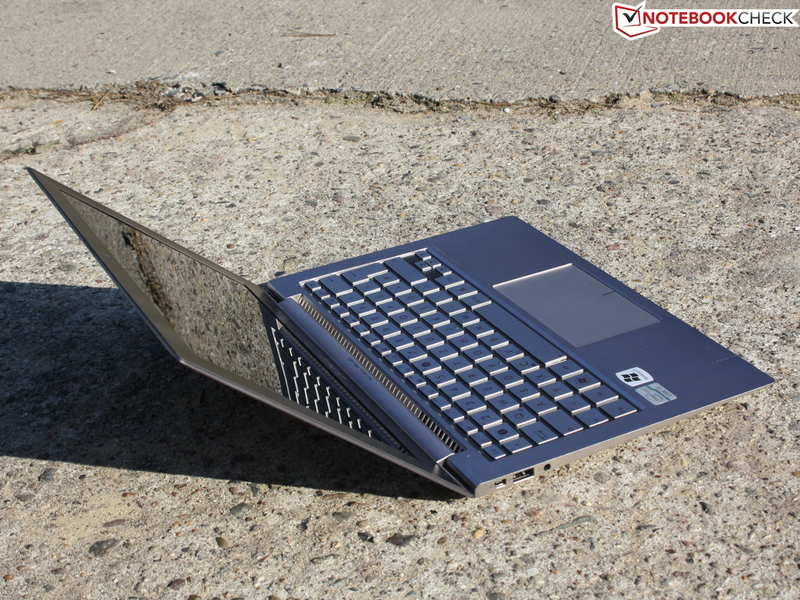 The more so as the 800€ version is equipped with a HDD, which delivers a significantly lower system performance. 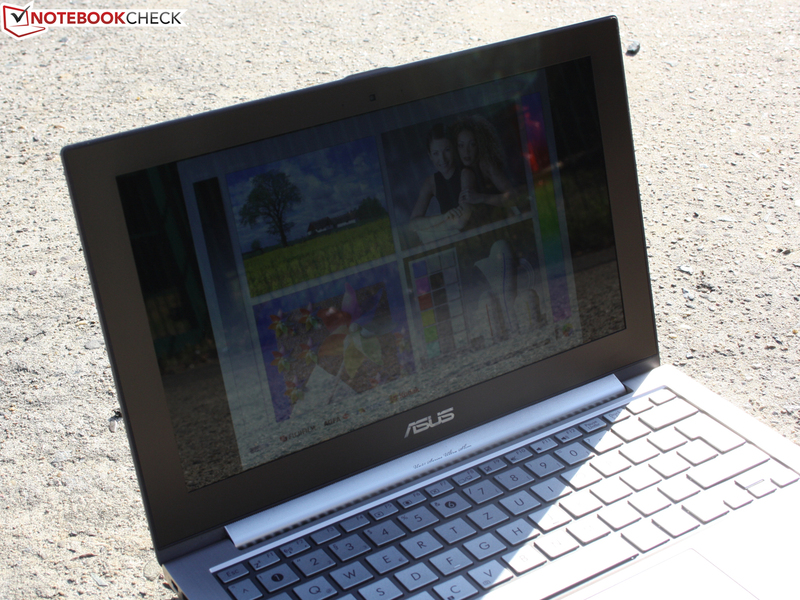 The Zenbook UX21E is the UltraBook from Asus. The cooling airflow is sucked in over the keyboard and blown out under the hinge. The details on the chassis are plain. It doesn't even have a separate power button. The power on button is part of the keyboard. Status LEDs for WLAN, CAPS lock and power on indicate the status. There is no HDD indicator. The user doesn't have to live without an Ethernet port and VGA socket because of lack of space, though. These two adapters are in the box for this. The network card isn't built-in; it is implemented via USB to Fast Ethernet. It supplies 45 watts. 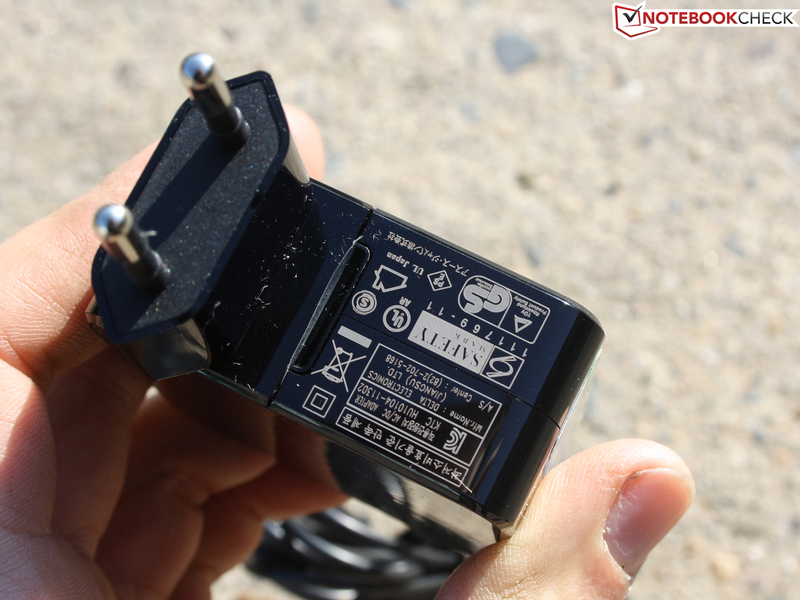 Perfectly suitable for the determined maximum power consumption of 34 watts (stress test without battery charging). The accessories bundle is finished off with the usual manuals, a high quality leather case, but without recovery DVDs. The battery (35 Wh lithium polymer, 6 cells) is built-in permanently and can't be replaced by a layperson. The four gigabyte of RAM and the WLAN module are soldered (onboard). A mini Torx is needed to lift off the bottom. 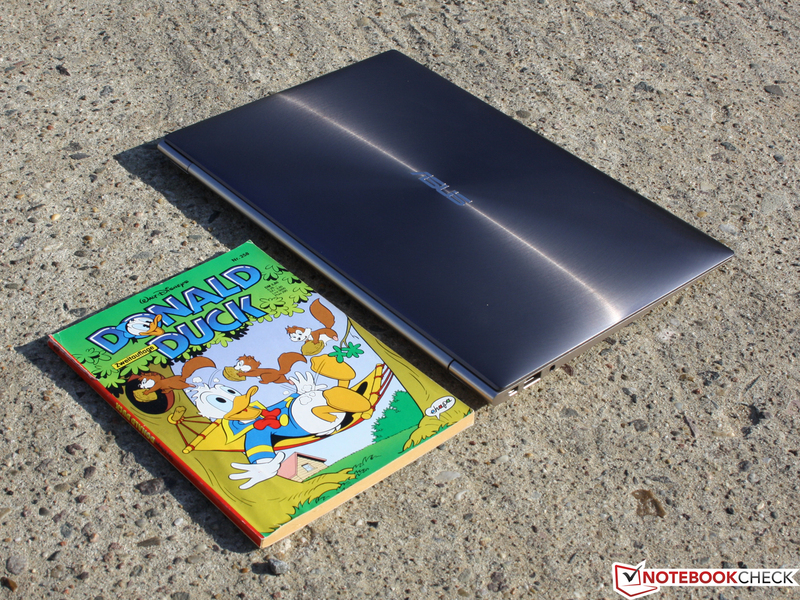 is to fuse the processing power of notebooks with the mobility of a "DuckTale" comic. Entertainment and work times of many, many hours. 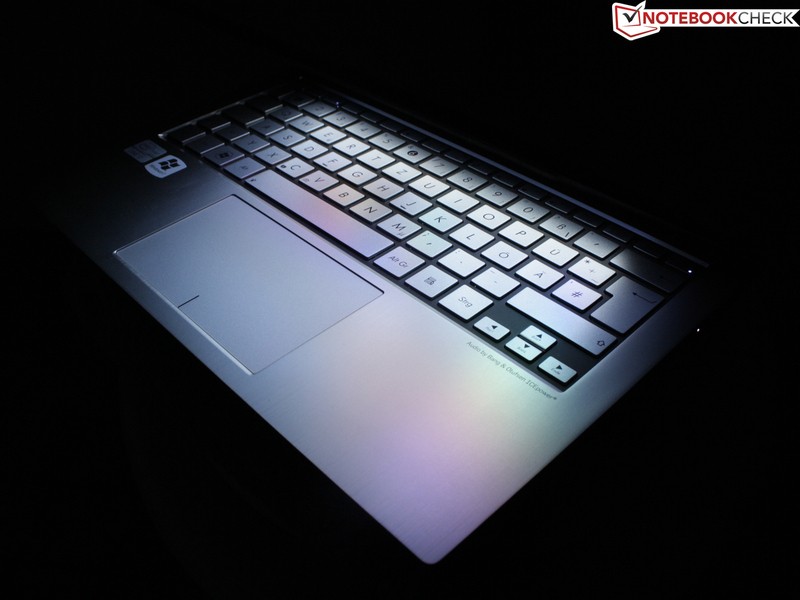 An UltraBook should at least reach a battery life of five hours. That is in Intel's requirements specifications. Our test device fails this with its 3:37 hours (WLAN test). The 11.6 inch UX21E is the small version following the 13 inch UX31E. The base unit has a height of only 17 mm - and that at the thickest place including the feet. 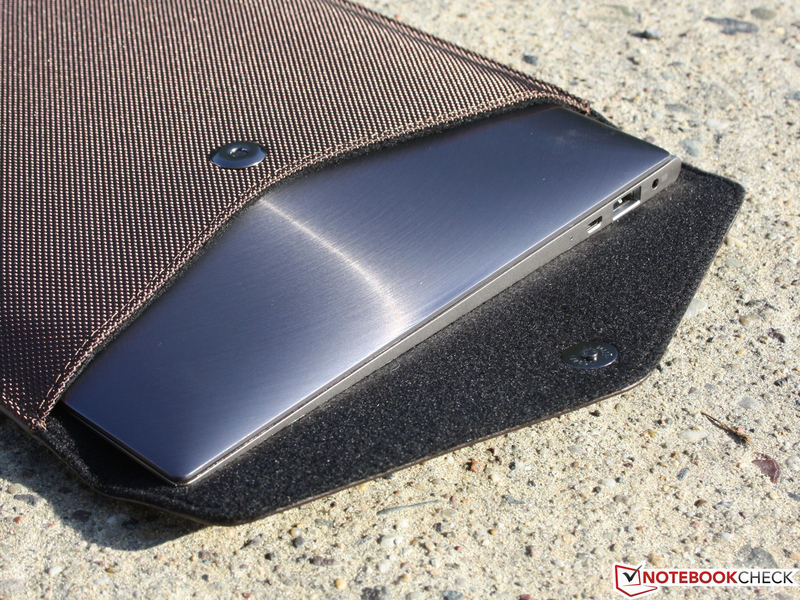 The case is milled out of one piece of aluminum and has a concentric polished surface. This results in nice light effects (lid only). The UX21E only weighs 1147 grams. Thus it's marginally heavier than the MacBook Air 11 (1070 grams). This small tab enables opening without breaking fingernails. The Book for tuners and upgraders? Rather unlikely. 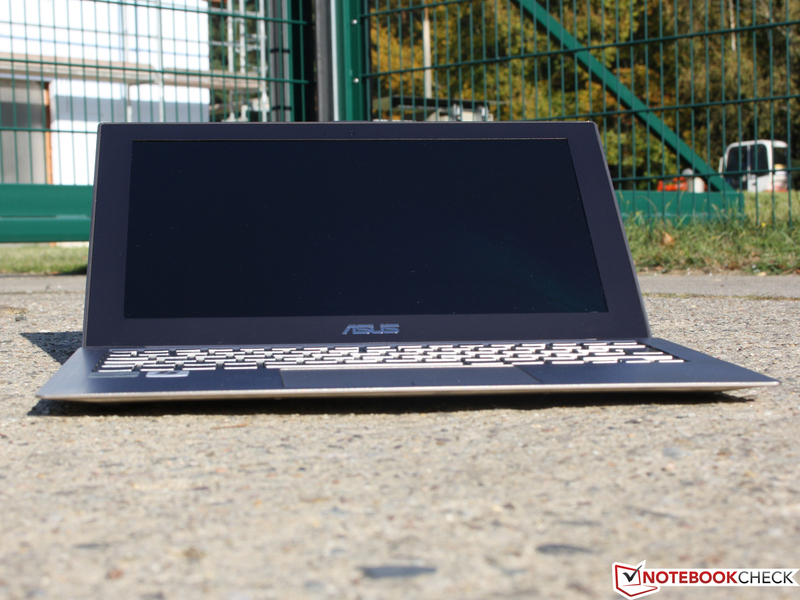 Asus Zenbook UX21E: A remarkable "piece" of subnotebook with a very high manufacturing quality and showoff potential. 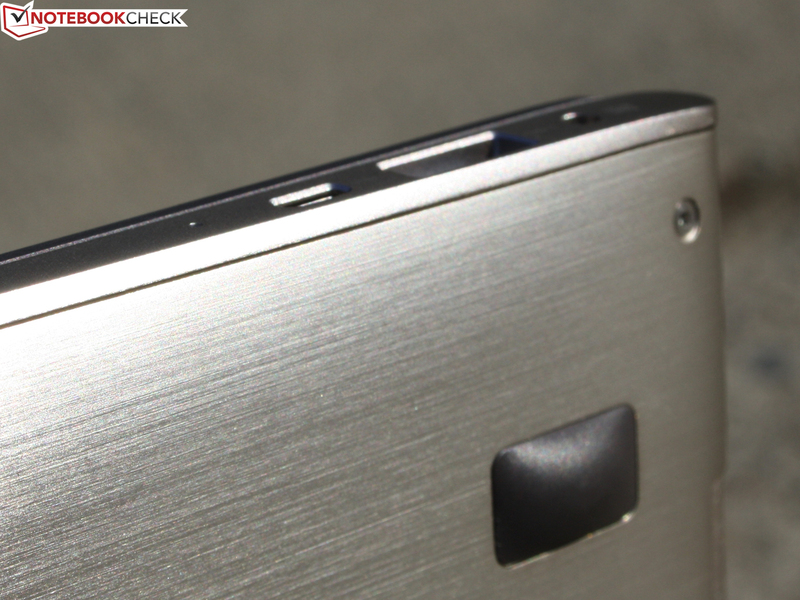 Unequivocally solid aluminum body. We gladly accept the few grams more compared to the MacBook Air. A battery life of at least five hours and wide viewing angles. So fast and so small. 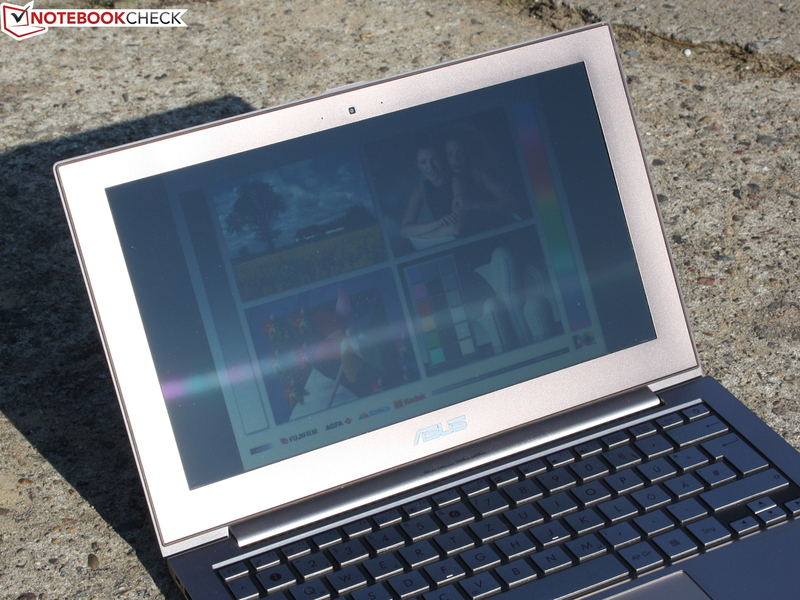 The UX21E is currently the fastest 11.6 inch laptop on the market. Acer Aspire S3-951 (13.3 inch); Samsung 900X1B (11.6 inch); Apple Macbook Air 11 inch 2011-07 MC969D/A (11.6 inch) and the UltraBooks to come in the next months.